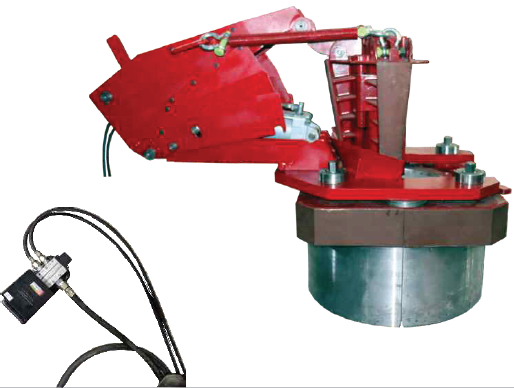 JOT manufactures Power Slip Lifter in different models, installed with Master Bushing or Casing Bushing that works as a lifter to hold drill pipe slips, drill collar slips or casing slips. 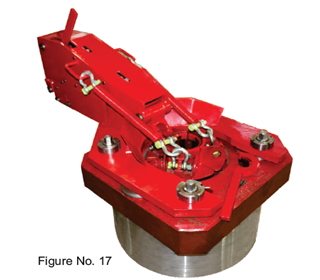 Lifter pushes the slip up & down in the Rotary Table to hold and release slips from tubular. It is controlled with the help of a foot valve. The Power Slip Lifter is designed to set more quickly & provide self-centering in Bushings that also avoids mishandlings of tools thus itself increase life of equipments. 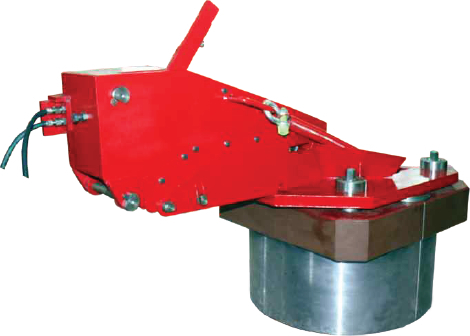 Slip Lifter is featured with a Lock Assembly to get locked in Master Bushing or Casing Bushing on Rotary Table at the time of operation for the safety of drillers. It reduces man power to handle slips manually that helps in avoiding accidents on rig floor. Power Slips has greatly improved operational efficiency in drilling operations and also increased Safety. Power Slip Lifter consists of: Part No. Power Lifter for Rotary Slip : It accommodates Rotary Slips in the range of 2-3/8" to 8-5/8". PSL-1750 P RT-17-1/2" Pin Drive 2-3/8" to 8-5/8"
PSL-2050 P RT- 20-1/2" Pin Drive Solid Body 2-3/8" to 13-3/8"
PSL-2050 P RT- 20-1/2" Pin Drive Split Body 2-3/8" to 8-3/8"
PSL-2750 P RT- 27-1/2" Pin Drive Solid Body 2-3/8" to 13-3/8"
PSL-2750 S RT- 27-1/2" Square Drive Body 2-3/8" to 13-3/8"
PSL-2750 P RT- 37-1/2" Pin Drive Hinged Type 2-3/8" to 13-3/8"
Power Lifter for Drill Collar Slip: It accommodates Drill Collar Slip in the range of 3" to 14". PSL-1750 P RT-17-1/2" Pin Drive 3" to 8-5/8"
PSL-2050 P RT- 20-1/2" Pin Drive Solid Body 3" to 14"
PSL-2050 P RT- 20-1/2" Pin Drive Split Body 3" to 8-5/8"
Note: Models of Power Slip Lifter for Drill Collar Slip & Rotary Slip are same. But an additional ring is required for Drill Collar Slip lifting purpose. Power Slip Lifter for Casing Slip: It accommodates Casing Slips in the range of 5" to 30". PSL-2700 -- RT- 27-1/2" CB 20" Split type 5" to 20"
PSL-3700 -- RT- 37-1/2" CB 20" Split type 5" to 20"
Base with Rings for 24" RT- 37-1/2" CB 24" Split type 24"
Base with Rings for 26" RT- 37-1/2" CB 26" Split type 26"
Base with Rings for 30" RT- 37-1/2" CB 30" Split type 30"
2 Easy to operate through foot pedal controller. 3 Featured with a Pin Lock Assembly. 4 Reduces number of personnel on Rig Floor. 5 Easy to remove Hoses before rotation with Rotary Table. 6 Arm Capacity to lift maximum two times the weight of slips. 7 Additional wrap arm / Ring (in two halves) to assemble Casing Slips. S. No. Part Name JOT Part No. Qty.